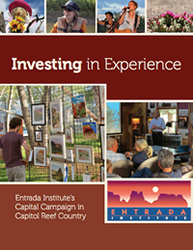 The Entrada Institute needs your help. Twice per year in the Fall and Spring we hold fundraisers. These events are essential to maintain and expand our programs. However, this page is available year-round for your donations. To learn more about our programs, watch our Annual Retrospective Video or visit our programming page. If you’d like to discuss planned giving, please email us at info@entradainstitute.org. Want to donate through the Facebook interface? Go to our Facebook Fundraiser. I want to support the entire Entrada Institute organization through a contribution to the general fund during the “Give Wayne County” campaign. We need your help in finishing up Phase 1 of our capital campaign. Contribute to the construction of our new performing arts stage. To learn more, go to our Capital Campaign page. I want to support the entire organization through a contribution to the operating fund.